Vestrahorn, Stokksnes, Eastern Region / Austurland • Iceland The area around Vestrahorn is one of the first settlement farms in Iceland. Founded by Hrollaugur, Earl of Møre in Norway. 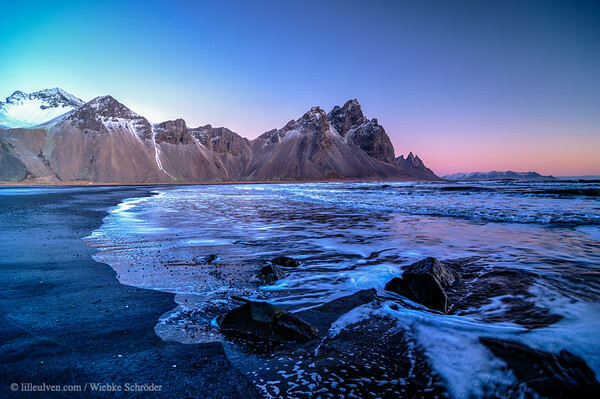 The mountain of Vestrahorn reaches 464m in elevation, while Brunnhorn, a strange shaped out-crop, stretches into the sea. Brunnhorn is also known as Angles Wings or Batman... uuid="FDFDD571-E966-46D9-BD3F-061F5B66DF77" id="Iceland lilleulven.com _K3_10449_HDR.tif Iceland lilleulven.com"